This is a sponsored post by BlogHer and P&G. We live in the south. This is football country. Friday night is high school football, Saturday morning is the grade school games, and Saturday afternoon brings the college contests. Sunday is all about the NFL, and we live in a House Divided. NFL Game Day around here means either baby blue, or green and gold, it depends on who you ask. 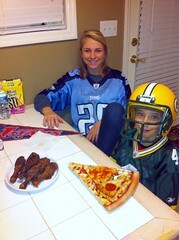 We live in Tennessee, but Busy Dad's family is from Wisconsin, so we cheer for the Titans and the Packers. The Titans have only been around Tennessee since 1997, but despite a rocky start getting here, the town has really rallied around them. We love to watch every Sunday where we simultaneously cheer for them, and complain about them (passing game, what's that?). They've been to the Super Bowl, and they've had seasons where they've lost 6 or 7 games in a row. There's been a couple of missteps along the way *cough* Pacman Jones *cough*, but our Titans are first class and they're a part of our community now. Game day around here is strangely enough often spent in the kitchen. I think it's mostly because we're still working around the house when the noon game kicks off, and we just start watching in there. Most of the time, we have the usual snack fare, but the Packers-Vikings game always gets brats, German potato salad and Sauerkraut in honor of the German heritage shared by Busy Dad and both teams. Oh, and if you're wondering: Aaron Rodgers. We go to the Titans games occasionally, but we really enjoy taking the NFL to our house the most. Be sure to check out the BlogHer.com exclusive offers page for 19 other bloggers’ game day stories! 1. Here’s a great opportunity to get some great prizes from one of the NFL’s sponsors, Procter & Gamble. Check out their “Take it to the House” program and photo contest, where prizes include a $10,000 community donation to support NFL PLAY 60 and an at-home visit from a local NFL legend! One lucky Grand Prize Winner will even win a trip to the 2011 Pro Bowl in Hawaii. Show us how you and your football family bring NFL game day to life at home at www.facebook.com/TakeItToTheHouse (click on the contest tab)! This football season, YOU have a chance to win some amazing prizes! In football speak, “Taking it to the House” means scoring a long touchdown, but this season, Procter & Gamble, one of NFL’s sponsors, wants to help you take it to the house as part of their Facebook photo contest. Prizes include an at-home visit from a local team legend, a $10,000 community donation in support of NFL PLAY 60 and P&G products. Show P&G how you bring NFL game day to life at home with your football family for an opportunity to meet an NFL legend, win awesome P&G products and get a $10,000 donation for a children’s health and wellness organization in your community in support of NFL PLAY 60. One lucky Grand Prize Winner will even win a trip to the 2011 Pro Bowl in Hawaii! It’s easy, moms! Just submit a photo of your “football family” on NFL game day. For more information on “Take it to the House” and to enter the photo contest, visit www.facebook.com/TakeItToTheHouse and click the contest tab.